To Receive Free Retail Display: Order 24 packs of item 99627. Made from acid-free polypropylene which contains an additional additive that allows it to biodegrade when tested according to the ASTM D5511. * Heavyweight, acid-free polypropylene. Reduced glare. For 11 x 8-1/2 document storage. 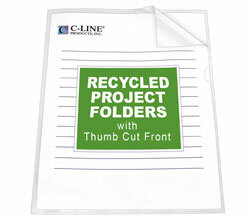 Open two sides with thumb cut front for easy access to documents. Unique corner design allows folders to expand to hold up to 100 pages. 5/PK. * Learn about ASTM testing and the time and conditions it takes for these products to biodegrade..